The Senecio genus has many potential houseplants, but this article focuses on the easiest to grow species which are the Succulent Senecios. Such as the popular String of Pearls. 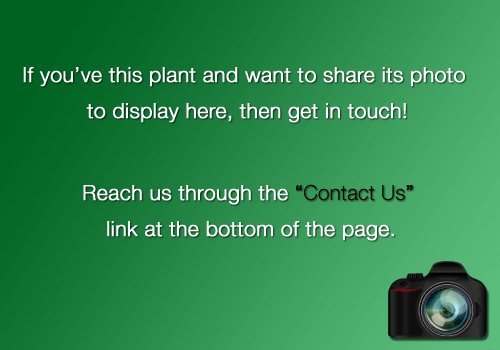 After giving you a run down of the different types you might come across we provide some care instructions for your Senecio plant to keep it healthy and great looking. 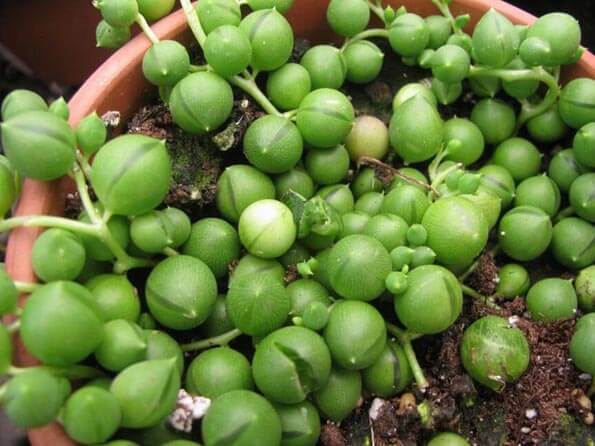 Arguably the most common and popular Senecio houseplant is the String of Pearls (Senecio rowleyanus). Looking like a group of neat similar sized peas tied to a string spilling out of their container, they're most definitely an acquired taste. Being so completely different to many commonly grown houseplants they make for a fun and unusual talking point. Senecio herreianus (String of Beads) shown in the picture above, is very similar except it has a more compact form and the shape of the leaves look more like different sized beads or grapes. Another popular choice is the very fashionable Senecio aquarine (Mount Everest) this plant is very modern and becoming increasingly popular. The finger like leaves and stiff stems have a grey or bluish green tinge. Growing upright it has a very architectural feel, especially when compared with the more messy and natural look of the String of Pearls. 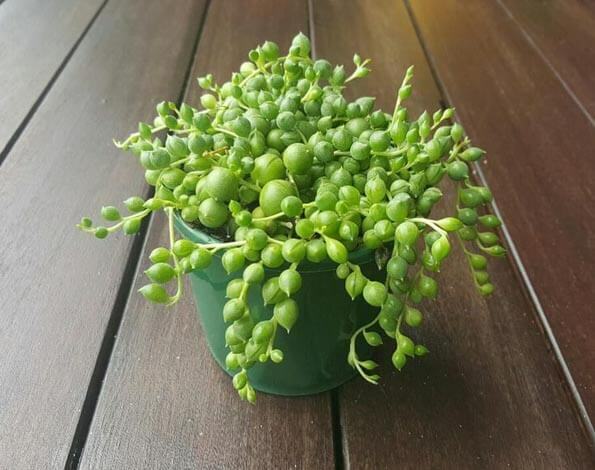 Other standout picks is the String of Bananas or Fishhooks Senecio (Senecio radicans) which grows very like the String of Pearls except the leaves on this one are banana or fishhook shaped. The plant is very easy to propagate so they don't cost much to buy when they're small, but as soon as you come across a mature plant which is being grown in an attractive pot or hanging basket the price shoots up. If money's a concern and you've the patience, you can of course start out with a couple of smaller cheaper cuttings and get that fully grown look yourself within a couple of years or so. How poisonous are String of Pearl Plants? Well the toxicity in these plants isn't deadly for pets or people in small quantities but as there can be general unpleasant side effects for both people and animals clearly eating these plants need to be avoided. The leaves of S. rowleyanus, S. herreianus and S. radicans can look like small fruits or sweets to some eyes, so they can be a problem around children especially those of S. rowleyanus (String of Pearls) because the leaves tend to be quite uniform in size. Unless you can keep these plants out of reach or out of the way, they might not be ideal to have if you've toddlers running around or playful pets, cats in particular, as the thin wavy stems can make for attractive cat toys. Succulent Senecios are very easy to grow indoors and forgiving of neglectful treatment and care. Of course they will only look their very best and reach their full potential as houseplants, if you treat them well. With that said, it's time to move on to the care instructions. Like most succulents they will need some sun or bright light to really thrive indoors. Many of the varieties you can buy will get by with less light but this in turns results in slower or no growth. 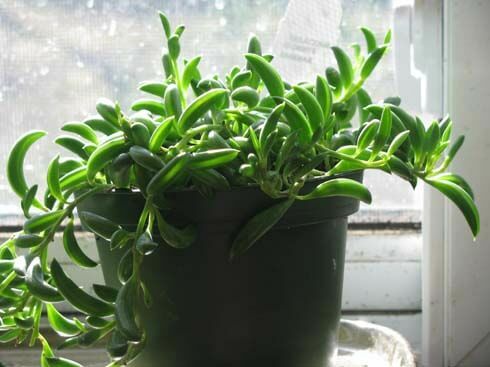 Unlike other succulents, Senecio plants do like water on a fairly frequent basis. A large number of plants growing in a pot (which is typical, see "anything else" below) use more water than a plant growing solo. That said they will easily rot if given too much water or allowed to fester in damp very low light conditions. As a rule it's advisable to wait until the soil has dried out a bit rather than keeping it constantly moist. In Spring, Summer and early Autumn as a rough guide, expect to water every 7 to 10 days providing your plant is growing in a bright warm location. In Winter once every three or four weeks is likely more than enough. Succulent Senecio plants are adapted to dry arid conditions so there is no need to increase humidity in a standard home or office. 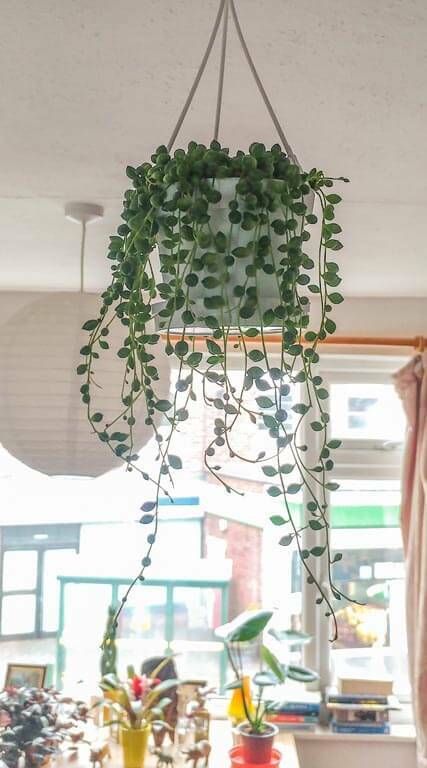 In fact you may actually find problems occur if the humidity levels are unnaturally high for whatever reason, as this can encourage damp resulting in rotting and the strings on your String of Pearls plant falling apart and rolling away! 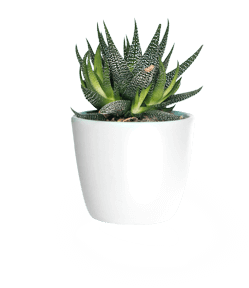 succulent Senecio's do need more water than other succulent houseplants, but you still need to be careful not to over do it. A fertiliser design for Cacti and Succulents is ideal, but you can always use a normal houseplant feed. Just make sure you dilute it to about half of the recommend amount listed in the instructions. Once every two months or so during the growing seasons will be enough to keep your Senecio healthy and thriving. Warm temperatures are welcomed. They can however tolerate quite cool temperatures if required, but don't risk exposing them to frost of any kind. 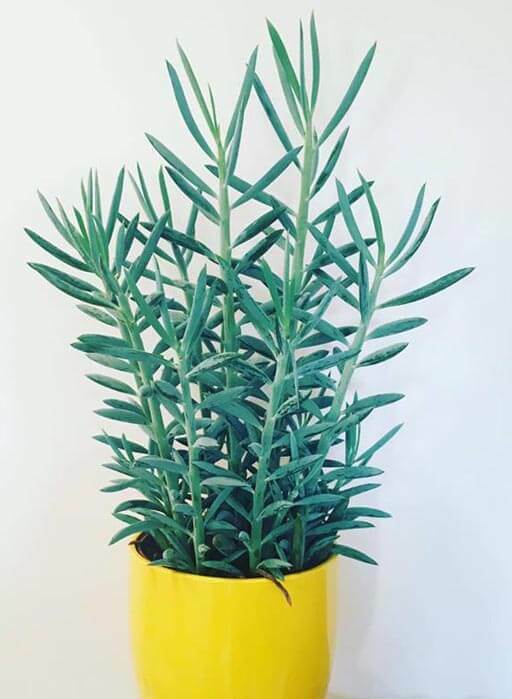 You only need to repot your Senecio when the container has become congested and there is little room for your plant to expand. It's also a good idea to change the soil every three years regardless because by this point the soil has likely broken down and is no longer absorbing adequate water or holding the necessary nutrients for your plant. When you come to do it, ensure you use a free draining growing medium, either ready made or you can mix normal compost with a little grit, perlite or sharp sand etc. 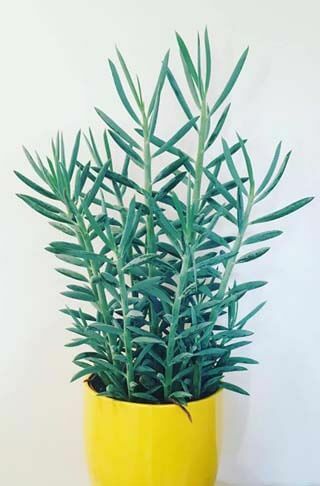 All succulent Senecio can be propagated quite easily through their stems or even their leaves. It's quicker to grow plants from the stems, which still have a few leaves attached. Simply press the stem into the growing medium far enough in to enable it to stay put and then just keep warm and the soil just moist and they should root fast. If you're using just the leaves you should let the exposed end dry for a day and then pot up in the same way. As mentioned this way of doing it takes more time, but you should still have new growth forming within a matter of weeks. When you provide good light levels, adequate water and warm temperatures during the day then you can expect moderate growth. There are many varieties which all have different growing traits. 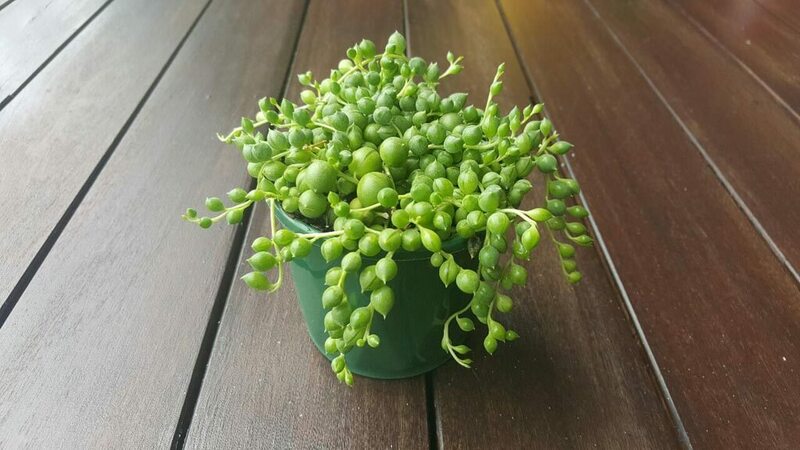 Some like S. aquarine, will be upright and quite slender growing up to 50cm / 20in, where as String of Pearls (S. rowleyanus) and String of Bananas (S. radicans) will be very short but can spread out significantly. It's the leaf shape and growth habit that people find desirable in these plants, however it's common to get a flush of small white flowers with colorful stamens at various times of the year. They aren't particularly showy and the smell they sometimes produce isn't in most cases very fragrant. These plants are mildly toxic to people and most pets including cats and dogs. Although the problems caused by ingesting the plant or getting sap on the skin are likely to be minor, care should still be taken to keep them away from curious pets or children especially as the unusual shape of the leaves can be inviting. The majority of succulent Senecio normally look more aesthetically pleasing when grown in close groups. This is especially true of the String of Pearls and String of Bananas. The individual plants tend to have just one or two stems and can come across as quite spindly if grown by itself. They almost always look better clustered, therefore when buying from a shop you will often find multiple individual plants growing together which creates a more "full" look. This is perfectly fine for your plant, or plants should we say, although it does mean grouped Senecios will need slightly more water and feed so bare this in mind. Mushy leaves indicates rotting and this is almost always caused by being too generous with the watering can. Yes they do like water, but if there is no drainage at the bottom of the pot, or you do it too often, then the plant's going to rot and turn into a mushy mess. Wait until the surface soil is dry to the touch before watering again. Go easy in Winter and above all, if there is water sitting at the bottom of the container or drip tray then pour it away. When light levels are low then this could be the result (move to a brighter spot). It could also be caused by overcrowding in the pot (time to divide your plant or move it into a bigger container). Finally if you've not fed your plant or changed the soil for a long time then it could be caused by nutrient deficiency (repot into fresh soil or start applying fertiliser every couple of months). Senecio plants in general are fairly disease and pest tolerant, but String of Pearls and the String of Bananas plant in particular are more susceptible to Aphid attack. If you want to see what they look like or you need some helping curing your plant of them, then have a look at our Pest Article.